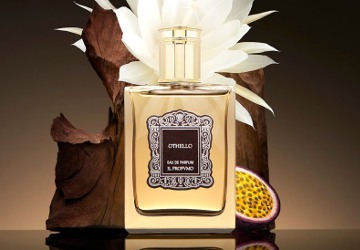 Italian niche line il Profumo has launched Othello, a new fragrance for men. Notes for the woody floral feature mandarin, lemon, passion fruit, sage, vetiver, birch, moon flower, patchouli, ivy, frankincense, oud and honey. Il Profumo Othello is available in 50 and 100 ml Eau de Parfum. Ohhhhh! Thank GOODNESS they left out Leather and Suede!!!!!!!!!!! Will this be in the United States, Robin??? Hard to say. Luckyscent does carry the line but they don’t seem to have any of the newer scents, and don’t know why. If you really want to try it, I’d order a sample at First in Fragrance when they get it. OsswaldNYC carries this line. Othello is not on the website yet but you can call them to find out when they are expecting them to arrive. Thanks — will add that to the perfume house page so I’ll remember next time. The notes sound lovely; I must make a point of sampling this.